I’m getting used to it, MIL is also mainland Chinese. It’s actually helping my Chinese though! I find the names of people particularly difficult, and I’m a native Chinese speaker, but of course I also speak Japanese. I’m always having to ask Chinese to write the characters for me because, like you, aside from a few well-known place names, I usually have no idea where they are talking about. funny cause for me the more kanji in a sentence the easier for me to read. hope you enjoy your time there…. This really gives me a headache too! 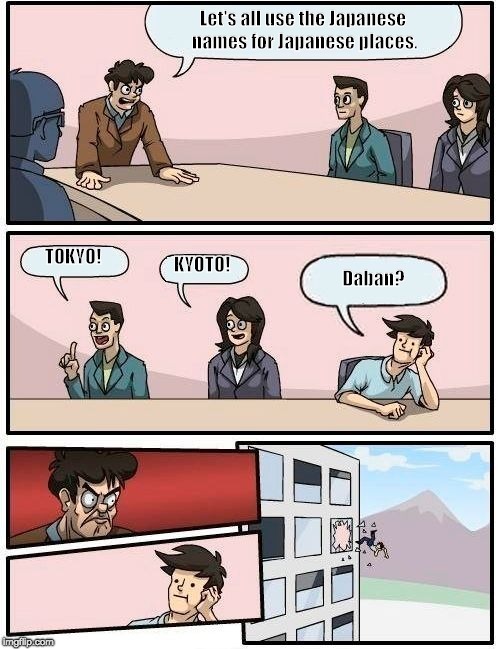 I once travelled around japan with two Taiwanese friends and had to get used to this for place names, especially challenging was being somewhere with Chinese speaking and non Chinese speaking people at once and having to switch between kinkakuji and jingesi and also golden temple with some English speakers. Aside from place names， it got annoying when my Taiwanese friends who don’t speak Japanese used the Chinese pronunciations of kanji that you often see out and about in japan such as 割引 or 無料 or 特急.